Martha Stewart…where would the foodie world be without her? I have to confess, I’ve never really paid her much mind. I don’t watch her show, I don’t subscribe to her magazine, and the only cookbooks I have of hers, from the Everyday Food series, were gifted to me by my parents-in-law. The most attention I ever paid is when she was in trouble with the law, and even then, it was only a small portion of my attention. She’s never really be on my radar, so to speak, but there is no question that she is a force to be reckoned with. I daresay she has helped shape the food and decorating world, taking simple items or ingredients and transforming them into stunning creations. She is full of great ideas, that one. And only Martha Stewart could come back the way she has after such a spectacular fall from grace. 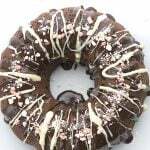 After realizing that diabetes was here to stay, one of her recipes was the first I ever attempted to make over into a low carb treat. It was a Cranberry Upside Down Cake and it worked out quite well, considering. I’ve learned a lot about low carb baking since then, and if I were to attempt it now, it would be a different beast entirely. It would be gluten free, for one thing. And probably tastier. But still, I thank Miss Martha for giving me the inspiration. Early on, there was also another dessert of hers, a cappuccino parfait made with ricotta cheese, that I knew would be easily adapted for my new dietary restrictions. The idea of using ricotta in a parfait stayed with me long after I’d tried out the coffee-flavoured version. And as I’ve always loved lemon and ricotta together, I started to think about flavouring it with lemon juice and lemon zest. But a parfait must be layered to be a parfait, after all, so the question became what to layer it with? The cappuccino parfait had crumbled amaretti cookies, but that obviously wasn’t an option unless I made some low carb ones. And I thought that the almond flavour of the amaretti would take away from the light, refreshing lemon. I wanted something fresh and slightly tart, like berries, and it just so happened that blackberries were in season and on sale at my local grocery store. The Results: No question, a ricotta parfait makes for a light, refreshing dessert and a nice change from my usual obsession with chocolate. And it’s very quick and easy to make, too. If you use whole milk ricotta, as I did, you don’t need a lot to layer with the berries. I sprinkled a little bit of chopped toasted hazelnuts on mine, for the crunch factor, but it’s just as good without. I am not sure I should really say this is dessert, because I ate the leftovers for breakfast the next day and it was wonderful that way too. The blackberries were a perfect foil for the lemony ricotta, and I imagine that raspberries, or even mixed berries, would be just as good. Combine ricotta, lemon juice, lemon zest, erythritol and stevia in a food processor and process until very smooth, scraping down sides of bowl as needed, about 2 minutes. Divide half of the berries among 6 dessert cups and top with half of ricotta mixture. Repeat with remaining berries and remaining ricotta. Sprinkle with chopped hazelnuts and serve. Serves 6. Each serving has 5.8g of carbs and 1.3g of fiber. Total NET CARBS = 4.5g. Oh I'm wishing I had one of these for breakfast right now. Could not look more delicious. Hello! it looks delicious and easy to do! And I love the ricotta cheese! Looks like a great breakfast option and one I'd love to try. The blackberries make me miss living in the Pacific NW. Sigh. This looks so delicious. I love how healthy this sounds, it looks so refreshing too! This looks so good I may have it on my free-day instead of a higher-carb treat. Yum. one of my girlfriends is about to go GF… i am sending her to your blog as we speak! Holy yum! I want! Do you think it would be acceptable to make this for breakfast? 😉 Thanks for sharing! Hey this looks cool……so yummy….I am hungry……must try..thanks for sharing..
Those are gorgeous!! I love using ricotta in desserts! 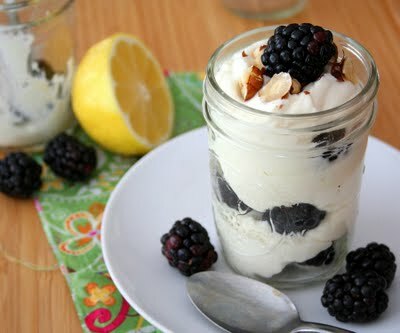 Blackberries and lemon – yum! Looks pretty and delicious! Yum! This looks so delicious and healthy! That's my favorite combination! Thanks for sharing! Looks so good!! I just bought some blackberries and was wondering what to do with them. Plus its gluten free, which is wonderful! Thanks! Blackberries and lemon are such a delicious combination. This looks fantastic! 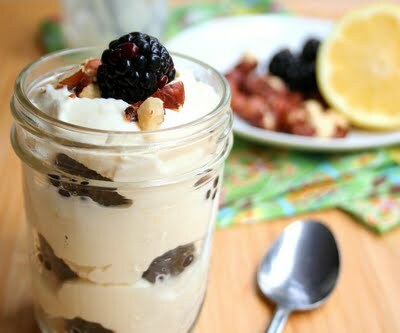 I really adore these parfaits! That’s just wicked goodness right there. Nice way to eat your blackberries! Nice that you were able to find fresh ones. Lemons and ricotta is right up my alley. How delicious! Can't wait to make this. The jars are just adorable for these parfaits. I never would have thought to use ricotta for this…looks like it turned out beautifully. Sounds amazing!I love the idea of ricotta in a parfait. I think this would make a great breakfast! Ricotta is good for so much more than just lasagna. I was so glad when I realized that! This looks delicious. I've actually enjoyed ricotta with balsamic and strawberries, so I'm sure I'd love this! 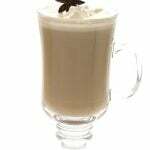 I like Martha Stewart as a starting point for recipe ideas but find many of her recipes unnecessarily complicated. The parfait looks so delicious and simple to make! I've been obsessed with ricotta lately, so this parfait sounds awesome. And don't underestimate Martha — she rules. This looks just brilliant. I have to say, the jars are just adorable for dishing this up! I am LOVING that! It looks really good. Love the idea of using ricotta instead of yogurt! This looks so cute in those jars! Oh Carolyn! I'd like my share now! Its perfect. I need to start making more things with Ricotta (besides lasagna). 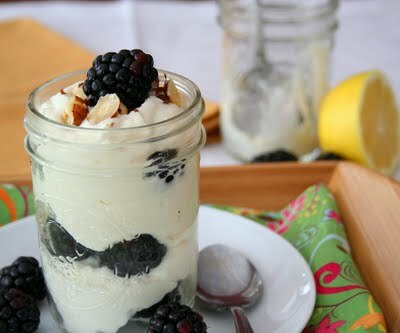 The parfaits look delicious and I love that you served them in Mason jars! Incredibly aesthetically appealing, say that 3 times fast! Oh my goodness…this looks so beautiful, and at the same time overly delicious!!!! Very well done!!! Beautiful parfait, Carolyn! Chalk one up to Martha! 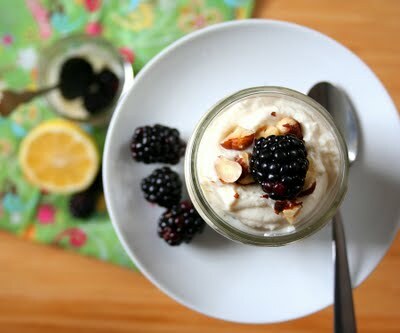 I love ricotta parfaits and serve them up over here often. These look great! Martha is definitely a force to be reckoned with; however, before Martha there was JULIA! 😉 I think the cooking world owes much to Julia Childs. 🙂 Bon Appetit! This looks absolutely perfect for me. One of my most favorite things in a jar? Yes, please…perhaps two. I never really dug on the idea of Martha Stewart, but I did read a book she wrote about business and respect her views. She is defiantly a force, just not my cup of tea. What I do dig is this dessert – it looks beautiful! Wow…looks like an amazing combo. Thanks for posting this delicious looking recipe. I love breakfast parfaits! I've never tried one with ricotta before. Yum 🙂 Must make! What a gorgeous summer parfait. I tend to find Martha very good for inspiration. That looks delicious and love that you put it in a canning jar. Such a touch of home. Eat that Martha. I grow weak at the knees when I see ricotta. A perfect parfait! Boy do these look good. I don't use too many of her recipes, but she is a force and her ideas do spark ideas in me. So I'd say that is a good thing. How lovely, I don't use fresh blackberries much as they're not really readily available here, this looks really good. Love the combo of blackberries and hazelnuts. 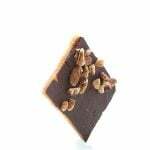 This is such a simple and delicious treat, and a great flavor combination. Yum! I’ve never used erythritol, could you just use more splenda instead? This was fabulous! I told all my keto gals! Excited to stuff this mixture into the crepes! This hit the spot. I was so tired of eggs for breakfast… Sad my husband had already eaten half of the ricotta, but there was still enough to enjoy. Thank you! The picture is kind of misleading. It shows what appears to be 2/3rds of what this recipe makes piled in one container. It tastes delicious though. It would be really nice if there were an easily printable copy (with a print button). I like to use print to file as pdf, and I don’t need 23 pages of recipe plus comments. BTW, I got your Keto Kitchen cookbook at Costco. Hi Trina, this is a really really old recipe that I don’t intend to update. It was from before I even had a recipe plug in. The vast majority of my recipes have a print button.